New ‘Rayo’ beauty dish coming from Mola? An online photographic store have listed a previously-unseen product called the Mola Rayo 16" reflector. 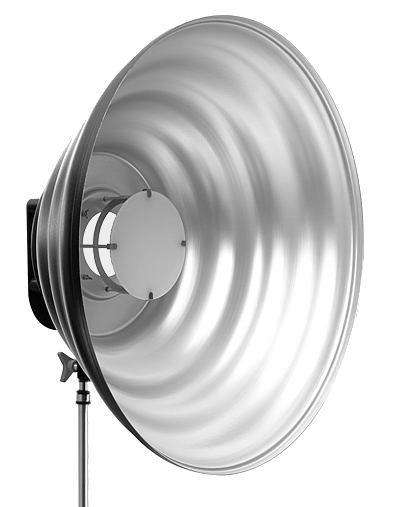 Canadian firm Mola launched a new model of 28-inch beauty dish reflector called the Sollo back in June. It is based on the design of the existing Mola Setti with a new, “one stop brighter” Satin Silver finish. The Sollo reflector is now on sale, retailing for US$760. Since then, New York-based superstore B&H Photo have a new listing for another reflector called the “Mola Rayo 16-inch“, priced at $236.50 (about $30 less than the Demi). There are no pictures yet, so perhaps it could be an entirely design from the manufacturer. The current line-up of softlight reflectors from Mola are all bigger than 16 inches: the 43.5″ Mantti, 33.5″ Euro and Beamm, 28″ Setti and Sollo and 22″ Demi. For more information on Mola reflectors, visit their web site.